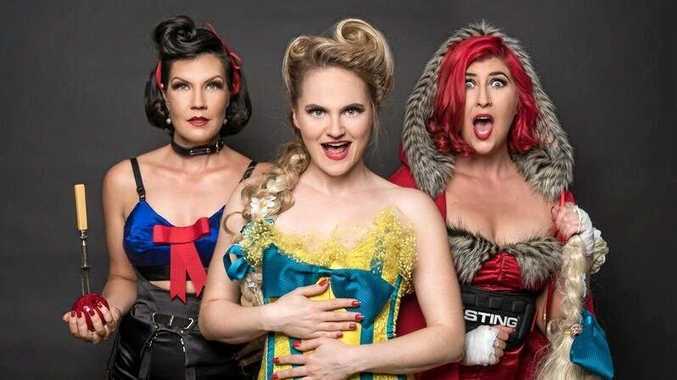 FAIRYTALES for grown-ups are the latest entertainment to hit stages across the west, with musical comedy quartet Babushka embarking on a bumper tour of rural Queensland. Cabaret fans may have caught the group on their last tour, when they performed as potty-mouthed princesses in Babushka in Doll. This time around, Alicia Cush, Bethan Ellsmore, Judy Hainsworth and Luke Volker have set their sights on bedtime stories. Classic fairy tales are getting the rude, crude comedy treatment that audiences have come to love from this group. Everyone's best-loved children's stories will be turned inside-out, and given the music treatment, so expect entertaining mash-ups of Kylie, Beyonce, and Metallica, just to name a few. Coming back to the country for a third time, Bethan Ellsmore said the touring party is looking forward to connecting with locals. "We love getting out to Queensland's regional towns, because you get a much closer interaction with the audience. "It challenges us to keep the performance fresh and new for each place we visit,” she said. Babushka have already kicked off their tour, performing in Isisford on Wednesday night, and tonight the curtain will be raised in Longreach. Muttaburra Shire Hall: Saturday, October 20, 7pm. Charleville RSL: Tuesday, October 23, 7.30pm. Paroo Shire Hall: Wednesday, October 24, 7.30pm. Quilpie Shire Hall: Thursday, October 25, 7.30pm. Windorah Community Hall: Saturday, October 27, 7pm. Aramac Town Hall: Sunday, October 28, 7pm. Tambo Shire Hall: Tuesday, October 30, 6.30pm.